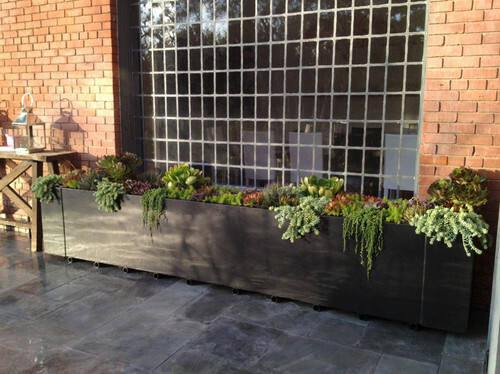 Just wanted to give you a quick round of my rooftop succulent garden. 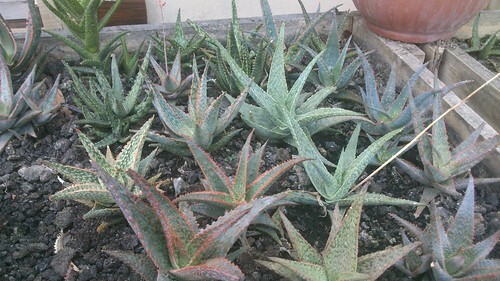 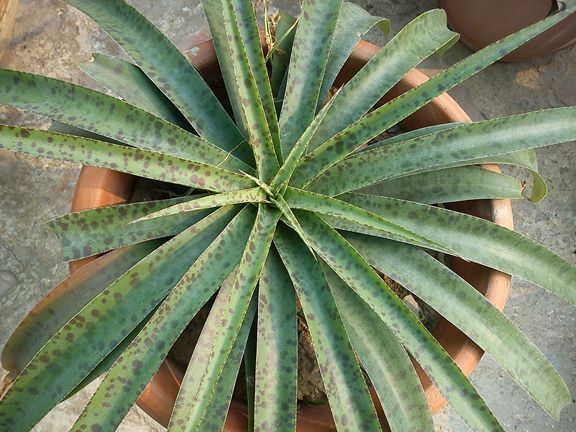 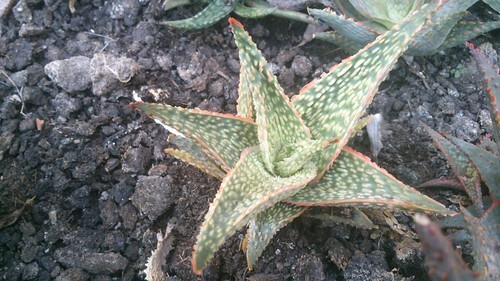 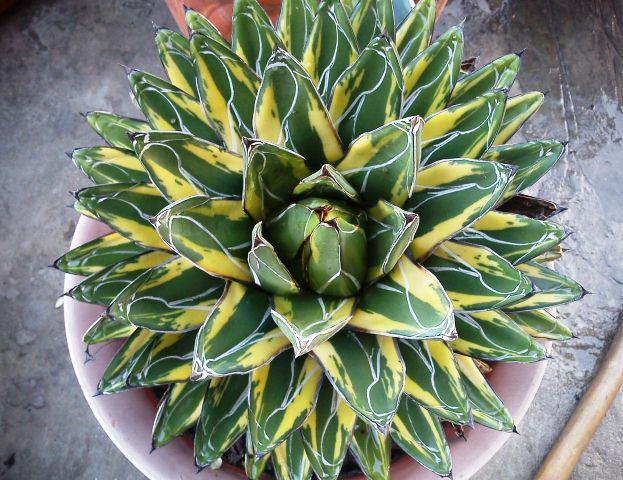 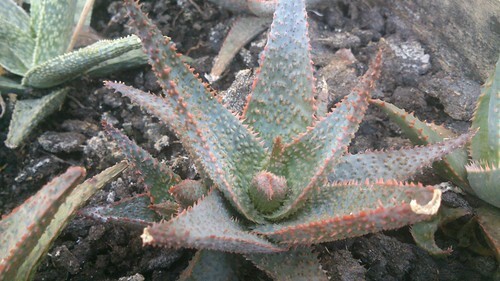 I have a few hybrids of Adeniums, a mixed variety of hybrids Aloes, and Sansevierias. 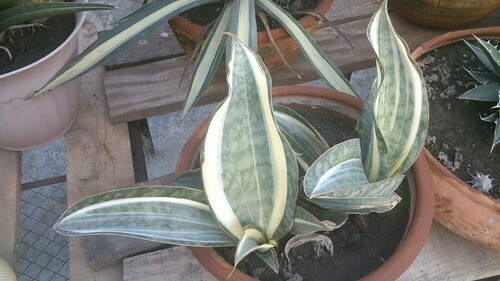 You can also see some grown up Agaves in these pictures. 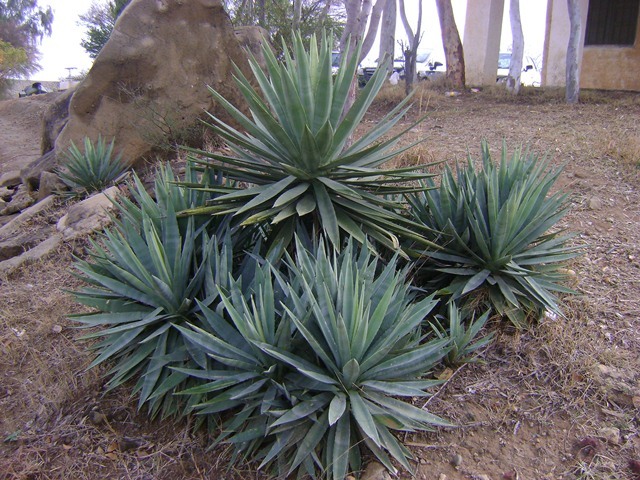 Agave attenuata is an excellent specimen plant for ornamental and landscaping purposes. 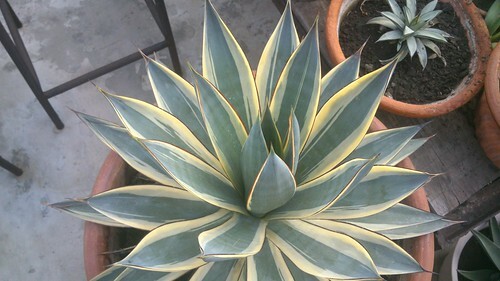 Unlike other species of Agave, this beautiful Agave does not have sharp teeth or terminal spines on its leaves, instead its leaves are softer and more succulent. 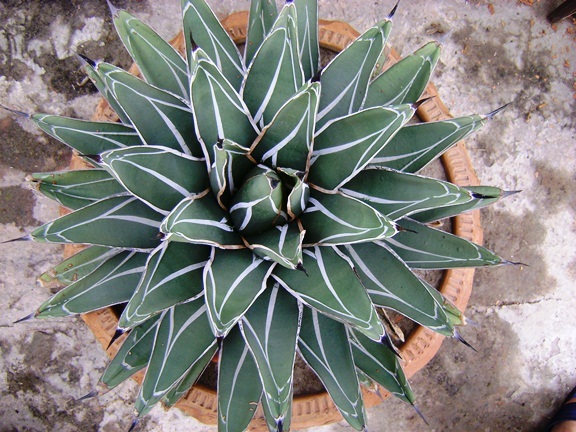 A healthy Agave attenuata would usually grow as tall as 4 to 5 feet and produce broad and fresh-green leaves (50-70 cm long and 12-16 cm large) that spread up to 4 feet. 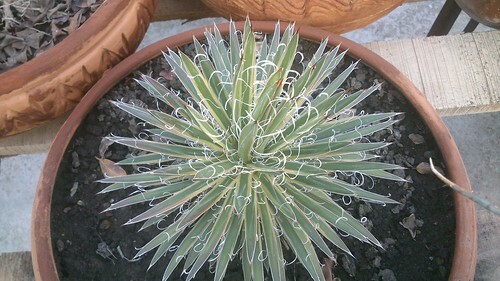 Mature plants have stout and curved stem, thus giving the plant its common name ‘foxtail’. 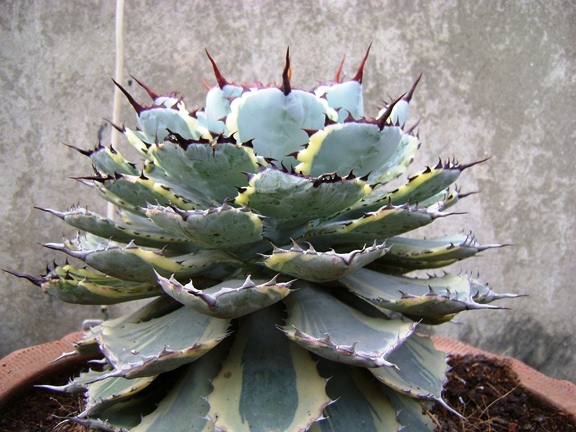 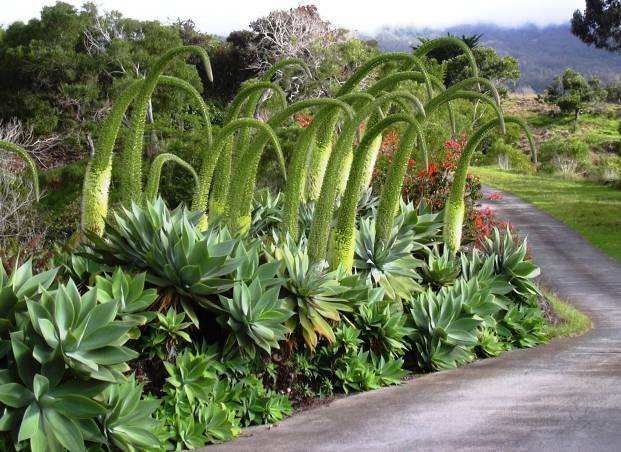 Agave attenuata comes from the plateau of central Mexico and thus requires similar growing conditions. 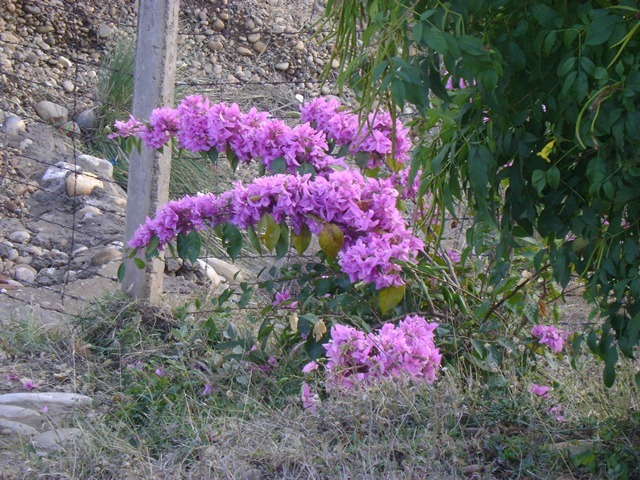 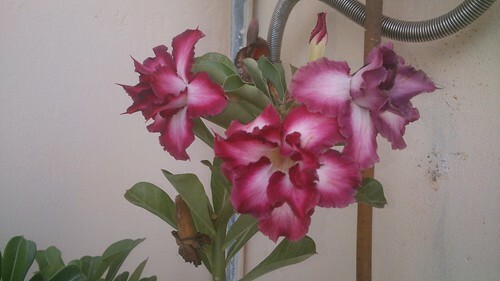 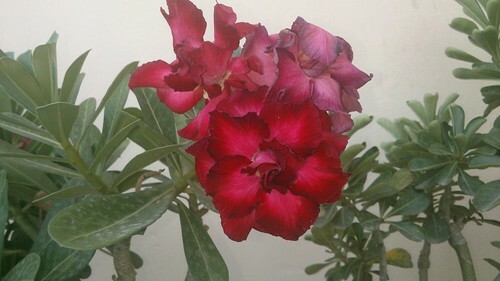 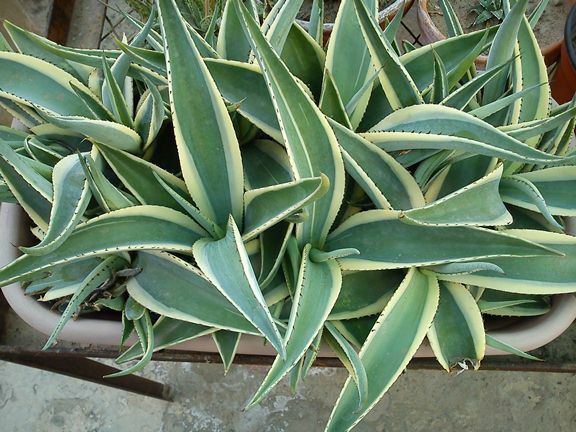 It prefers lightly moist and loamy soil thought it can grow in poor soil and withstand drought. 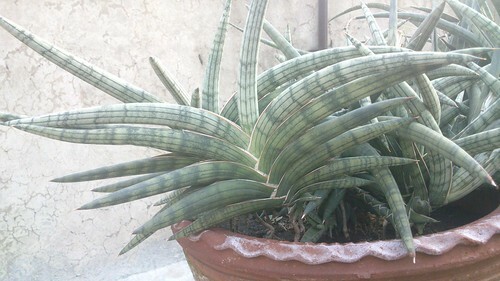 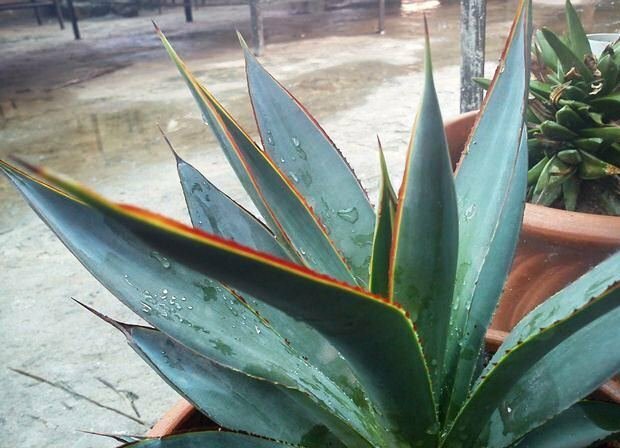 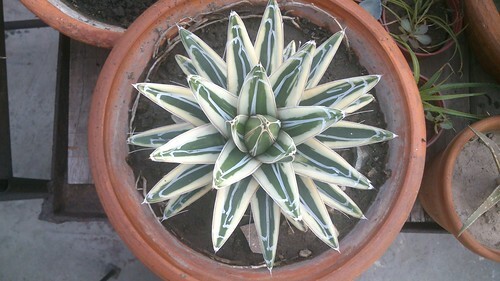 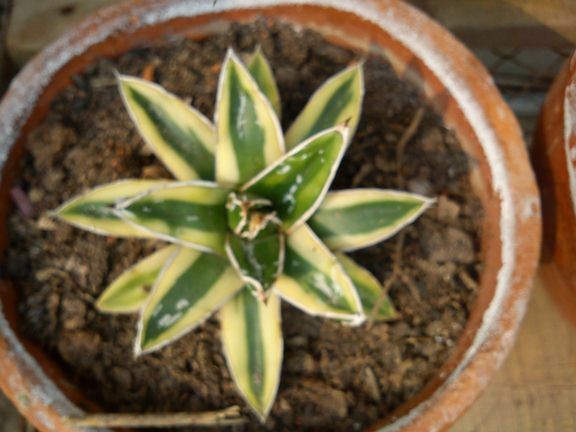 Protect this agave from direct scorching sunlight in summer and from long spells of frost and freeze. 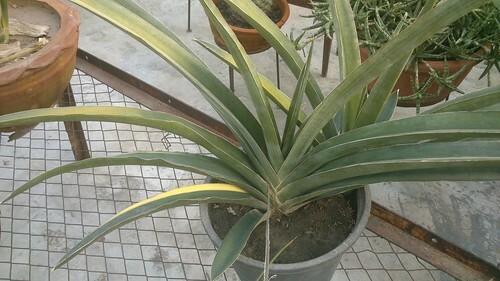 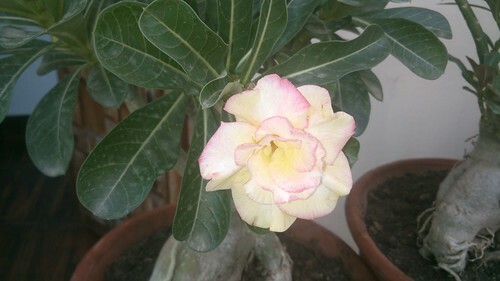 The plant produces beautiful inflorescence of white or cream color on a long stalk in spring followed by bulk of seed pods or small plantlets. 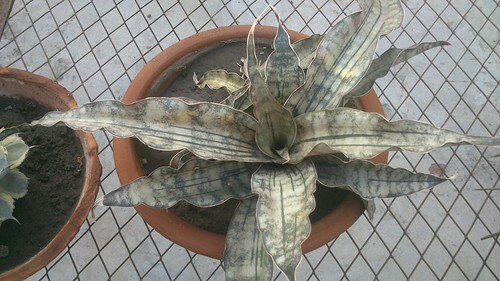 The stalk is often drooping with flowers, that is why, the plant is also called Swan’s Neck Agave. 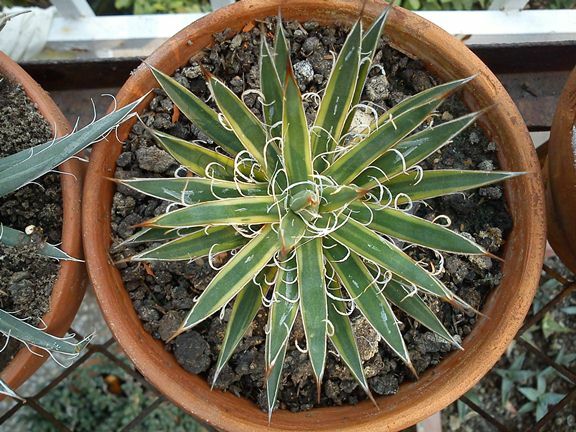 Agave attenuata can be grown easily from these seeds, plantlets, or suckers. 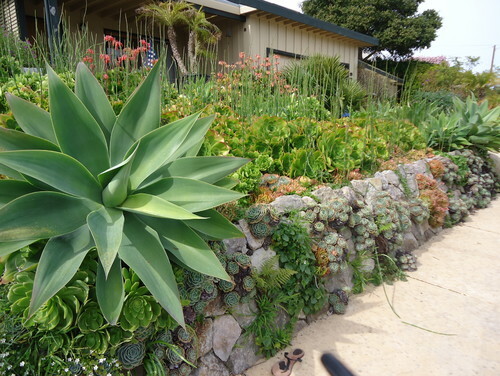 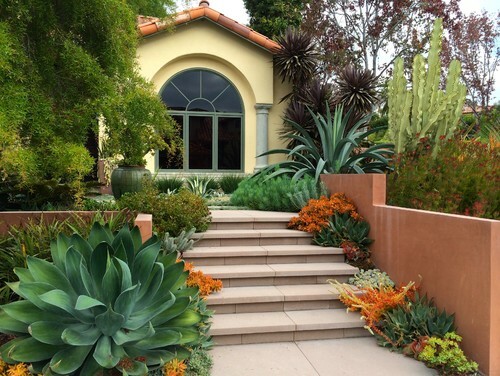 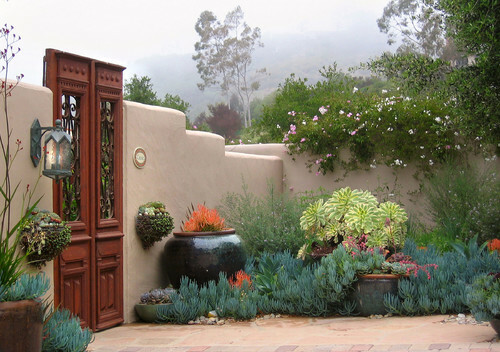 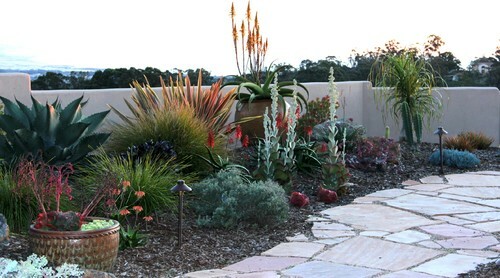 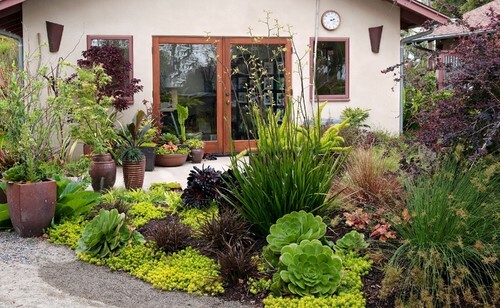 Foxtail or Agave attenuata makes an excellent plant for both landscapes and containers. 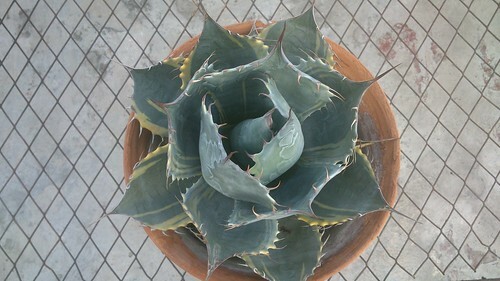 Today I am featuring Agave ‘Blue Glow’ which is one of my favorite of all agave plants in my collection. 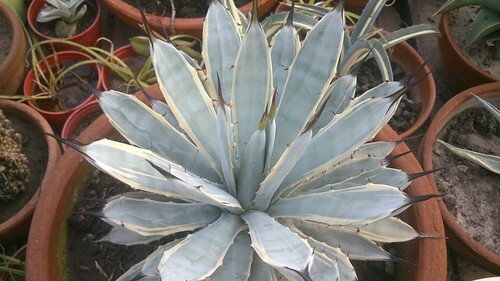 Agave ‘Blue Glow’ is supposed to be a hybrid between Agave Attenuata and Agave Ocahui – ‘Blue Glow’ has long narrow leaves (from Agave Ocahui) with a terminal spines and almost no marginal spines (from Agave Attenuata). 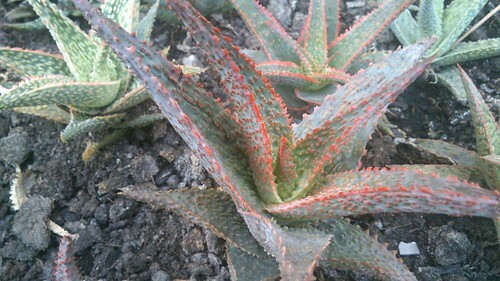 Dark blue-green leaves have red margins that glow when seen at eye-level with sunlight in the background. 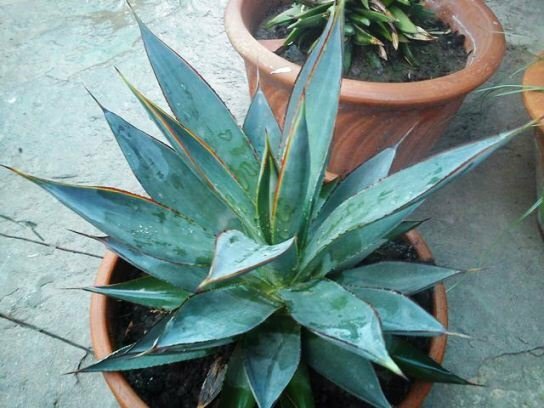 Agave ‘Blue Glow’ is relatively slow growing plant that tends to grow solitary. 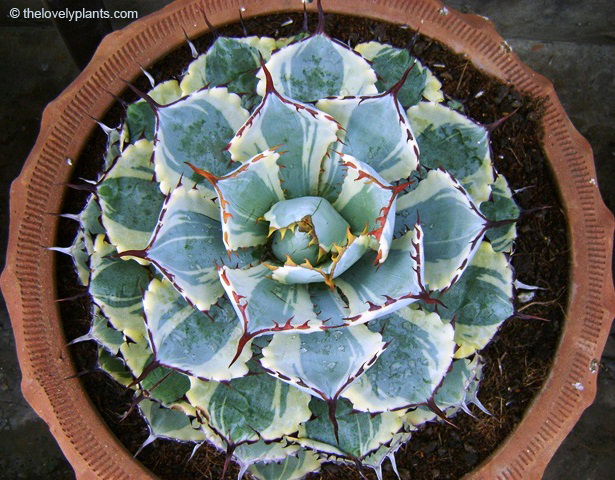 It forms a compact rosette of up to 18 inches in height and spreads as wide as 2 feet- suitable for growing in containers. 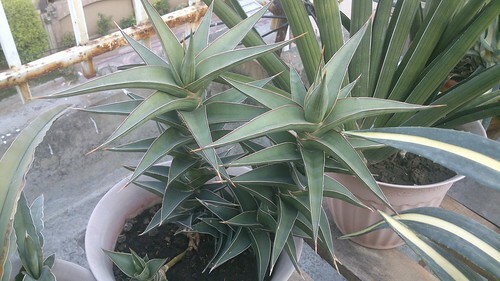 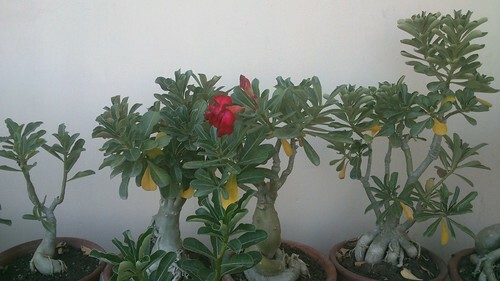 The plant in picture is about 2 years old and was grown from a small offset. 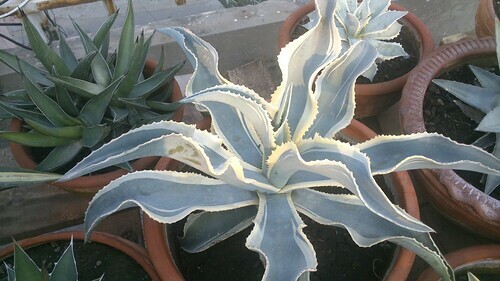 Agave ‘Blue Glow’ prefers bright sunlight but protection from direct harsh sun of summer. 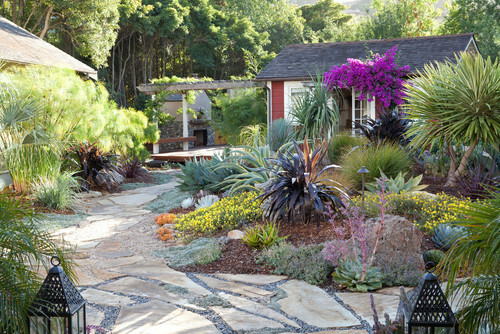 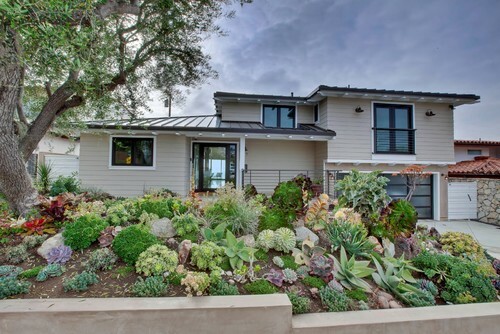 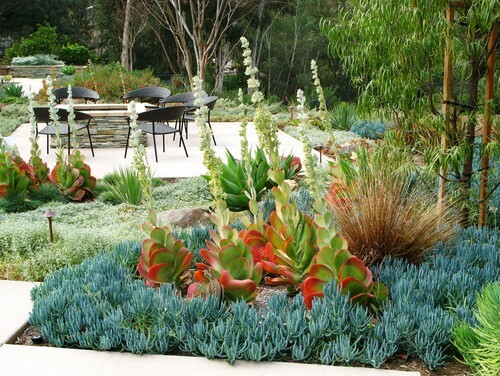 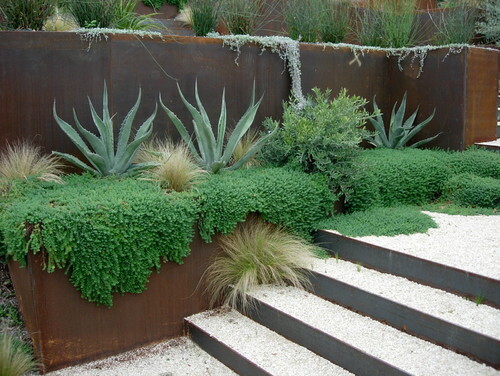 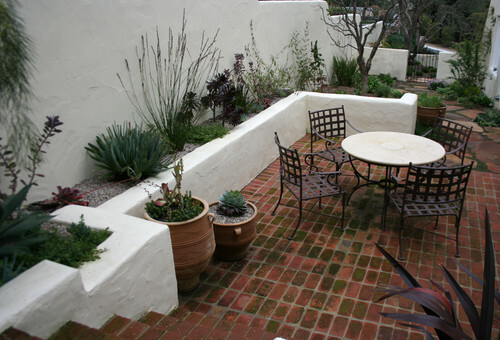 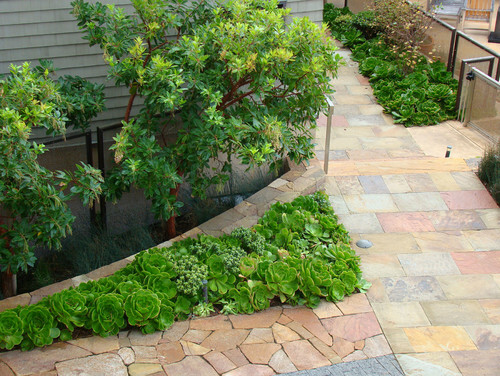 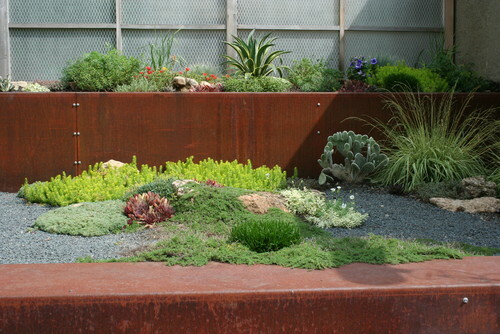 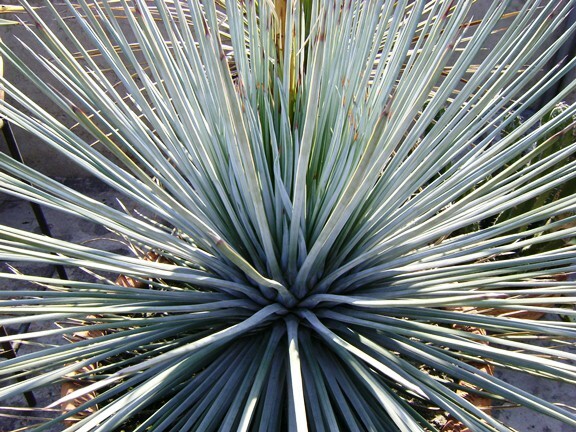 It is quite hardy, easy to grow, and drought tolerant. 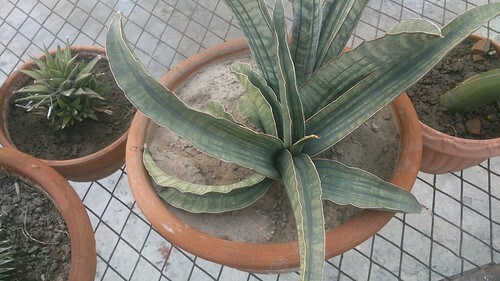 I am growing my plant in a terracotta pot in my roof garden. 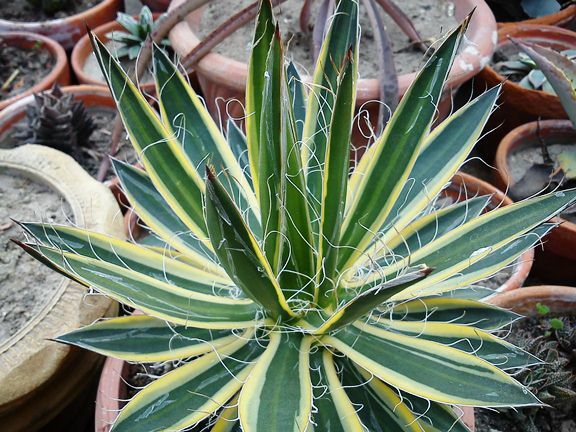 Agave Potatorum ‘Kissho Kan’ is a compact, slow growing plant that bears short blue-grey leaves with yellow margins and red spines. 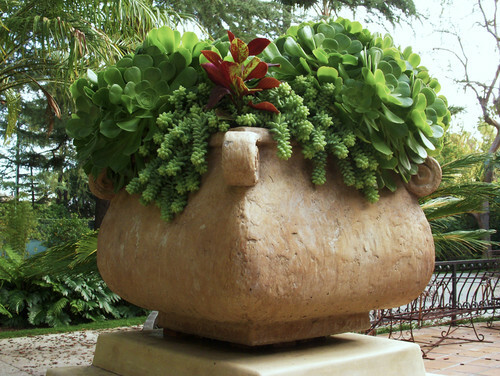 Kissho Kan makes an excellent container plant because of its compact size(12 inches tall and 12 inches wide, max. 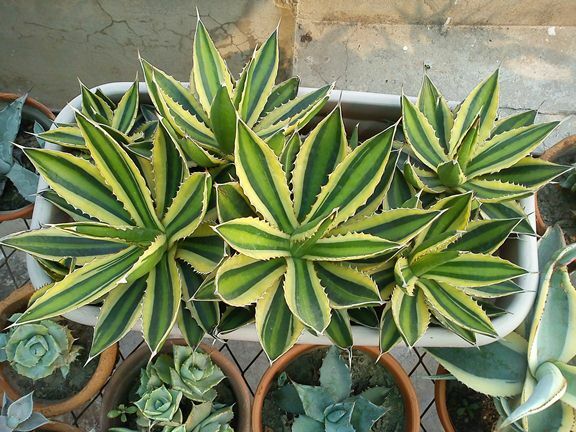 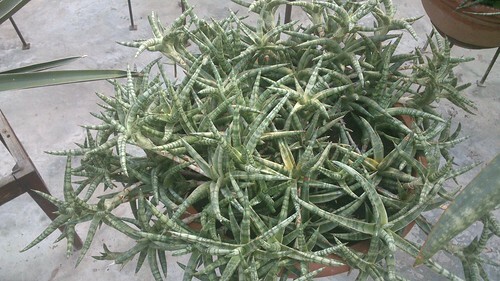 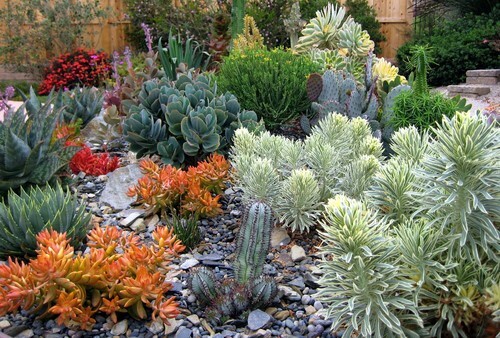 ), regular proportions and nicely variegated succulent leaves. 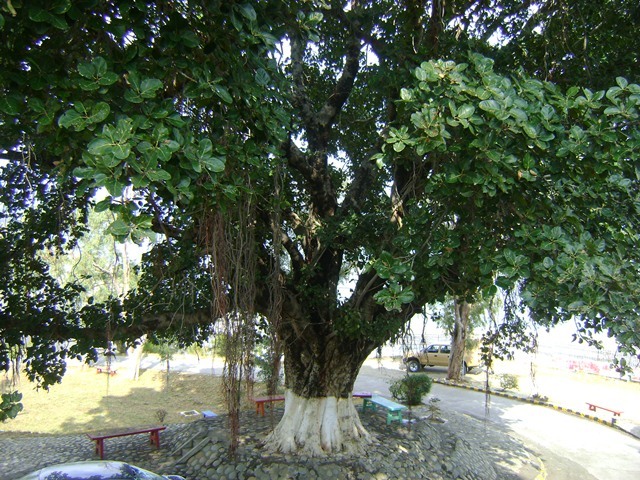 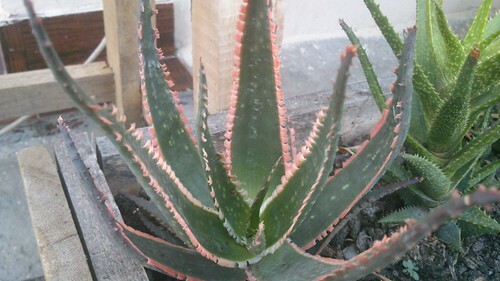 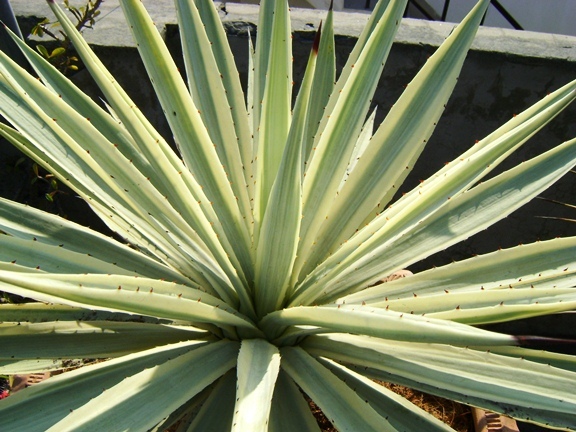 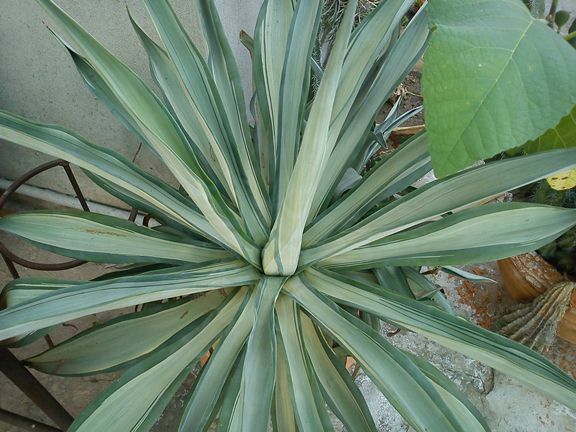 The plant is considered a Japanese cultivar and a distant cousin of Agave Parryi. 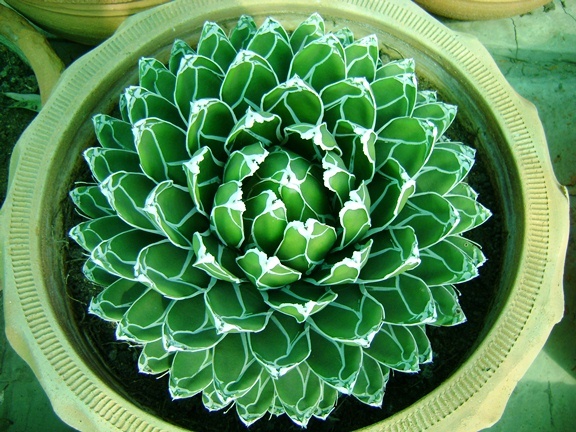 The name Kissho Kan is translated as ‘happy crown’ or ‘lucky crown’. 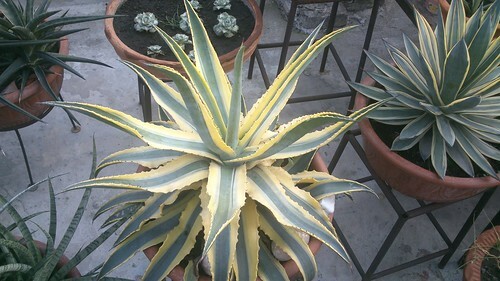 Agave Potatorum Kissho Kan bears yellow blooms that grow on a long stalk like all other agave plants. 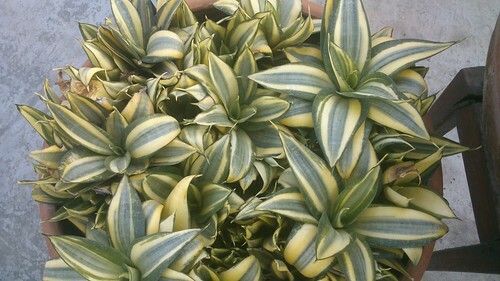 Kissho Kan is easy to grow under filtered sunlight and moderate watering. 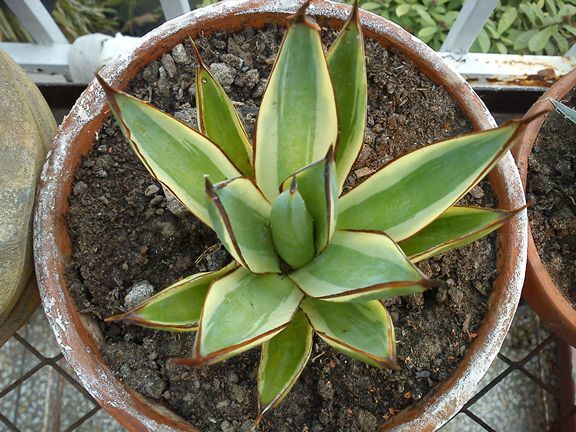 Normally, it would grow solitary and form hemispherical shape. 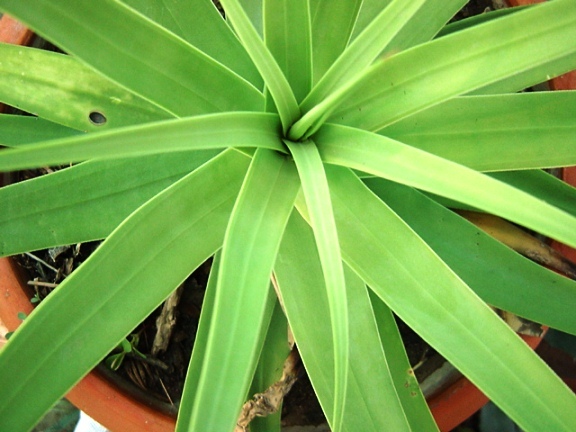 Mature plants produce offshoots that can be rooted and propagated easily. 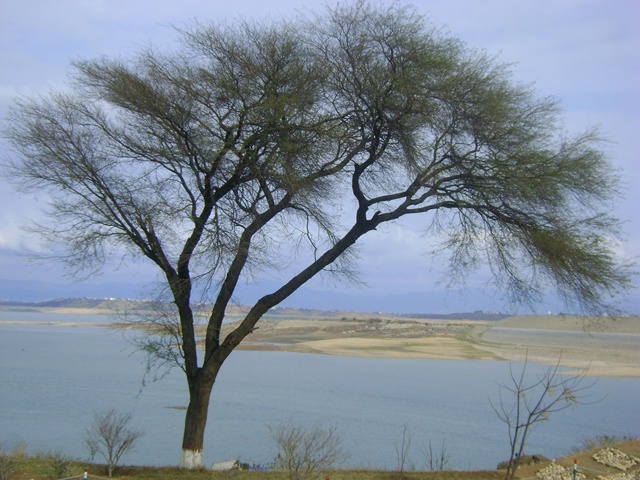 Kissho Kan withstands drought and cold spells to -3° C.
Just spotted these plants on my trip to Mangla.